With the information and data we gain from our advice services – 60 Citizens Advice Bureau, the Extra Help Unit and the Citizens Advice Consumer Service – CAS’s policy work completes a virtuous circle of advice and advocacy, with each informing the other. Over five years the energy advice provided by the CAS network has more than doubled. Our stakeholders can be confident that our engagement with them is informed by consumers’ real life experience. Taken together with our independent consumer research programme, this ensures our policy and advocacy work is based on evidence. The significant progress that has been made towards regulation of district heating in Scotland, following our recommendation to the District Heating Expert Commission on Regulatory Options and consequent research which concluded that district heating consumers need greater protection. The Scottish Government is taking forward several of our recommendations, and following our evidence the Competition and Markets Authority established a preliminary investigation that echoed our call for the regulation of district heating, including consideration of a licensing scheme. Action to address the persistent problem of parcel surcharging experienced by consumers in some parts of Scotland, following our research and advocacy. The Committee for Advertising Practice took enforcement action directed at companies with misleading online delivery claims. Our report was the subject of discussion raised in both the UK and Scottish Parliaments and governments, and the Consumer Protection Partnership (CPP) is co-ordinating further action. Our research on a simpler registration process for vulnerable consumers to access support from their utility companies, which is generating interest and engagement from government, regulators and companies. 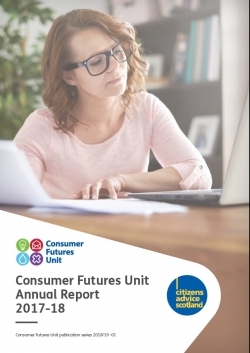 We have recently published our work plan for 2018-19 (https://www.cas.org.uk/publications/consumer-futures-unit-work-plan-2018-19).